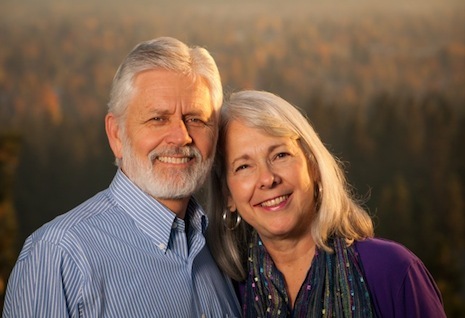 Conrad and MarJean Peter’s ministry to encourage pastors and missionaries began in 2005 through hospitality, on-site visits, publications, counseling and phone calls. Since their move to Spokane in 2013, Conrad serves as Regional Partnership Coordinator. He makes contacts and travels to meet with individuals, mission groups and churches to raise awareness and support for ABM. Phone calls, e-mails, FaceTime and trips back to Alaska, particularly for Ministry Family Retreats, keep them connected to staff and ministry families. MarJean writes, edits and administrates the publication of Courage for Bush Ministry Women and other ABM publications. She draws from a lifetime of experiences to inspire and encourage others in faith and practice. Her years as a teacher, pastor’s wife, writer and illustrator prepared her to write and edit for various ABM publications. Her books on Amazon include: By Design—A Search to Understand & Love You Better; The Weaver; Squanto—A Story of Compassion; and Ruby—A Story of Kindness. Conrad and MarJean still enjoy opportunities to present By Design, which includes personal profile assessments which they give to individuals, couples, at retreats and to mission groups. Their heart for people compels them to offer this practical tool to increase love and understanding for one another and gratitude and reverence for their Creator/Designer. Conrad grew up in St. Louis, MO, where his dad pastored. His family relocated to the San Francisco Bay Area where he attended Jr. and Sr. High and Corbin College. After a year at Moody Bible Institute, he moved to Fresno, CA and his parents left for Vietnam as missionaries. He graduated from Fresno Pacific University in 1969 and married MarJean Quiring. They moved to Portland, OR where Conrad attended Western Baptist Seminary and received his Masters of Divinity in 1973. His years of pastoral experience in the Pacific Northwest, Canada and Alaska prepared him to love, understand and encourage ministers in various social and economic backgrounds. MarJean spent her childhood on a farm in northern Saskatchewan, and her teen years near Dallas, Oregon. She earned a BA degree in Art Education and English Literature from Fresno Pacific University in California. Nearly fifty years ago she married Conrad, and they raised three awesome sons, Jonathan, Jamison, and Joel and one beautiful daughter, Charissa. They now also delight in four loving in-laws and seventeen grandchildren. Their adventurous lives continue to provide a rich variety of culture, friends and experiences that equip Conrad with people skills to encourage the many pastors with whom he meets and inspire MarJean’s faith-based articles, stories and books.